Atlanta is one of those cities I’ve always wanted to visit, but it’s never quite gotten to the top of my list. 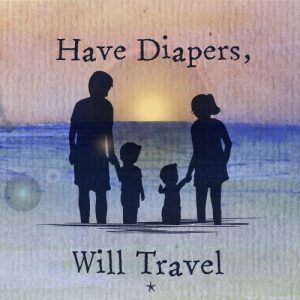 Well, that changed this past week when we spent a long weekend in Atlanta during spring break and got to experience all of the amazing things to do in Atlanta with kids, including all of the best family friendly attractions, and the best places to eat in Atlanta with kids. 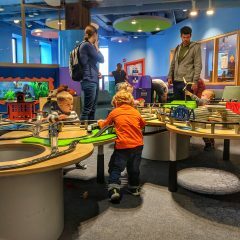 We got to learn a lot about visiting Atlanta with kids and some of the best attractions the city has to offer, so read through our detailed guide for things to do in Atlanta with kids. Like any city, you really don’t need a car when visiting Atlanta. 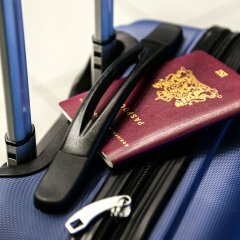 If you’re flying into Atlanta’s International Airport then you’ll be able to take a hotel shuttle, car service or Uber into the city, and you really won’t need a car after that. Plenty of the city’s attractions are a walkable distance, especially if you stay in the downtown area, and Uber is a safe and affordable option to visit the areas of the city that aren’t quite walking distance. More importantly, if you have a car your hotel will probably charge an overnight parking fee which is best avoided if possible; our hotel charged an eye watering $40 a night for parking! 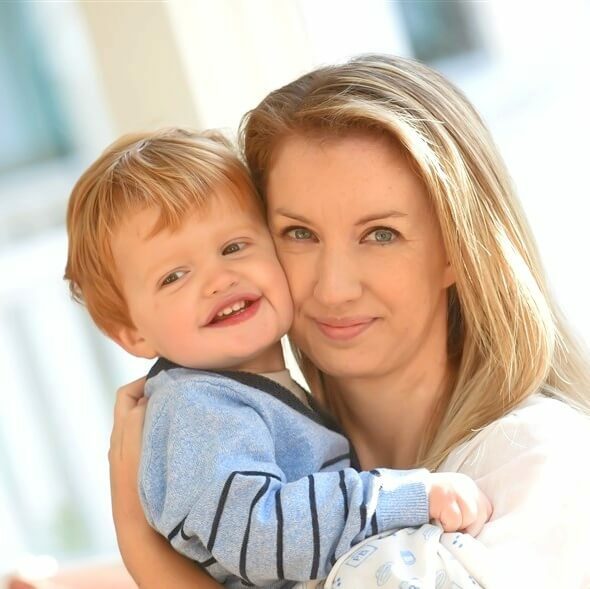 As with any city, be aware of your surroundings and don’t wander around in areas you’re not familiar with after dark; we felt safe enough walking around the city during the day, but after dark I wasn’t 100% comfortable walking around with the kids. Of all of the things we did in Atlanta, this was our favorite. The Georgia Aquarium is located in downtown Atlanta close to Centennial Olympic Park, and is an easy walk from any of the downtown hotels (there is also a parking garage if you plan to drive). It is open 365 days a year, although operating hours do vary from day to day, and as with most attractions, tickets are cheaper if purchased online in advance. Georgia Aquarium is also part of the Atlanta City Pass, which can be purchased online ahead of time or at the aquarium itself. For conservation purposes, the Georgia Aquarium does not print paper maps, but you can download their free app that has a map that lists all of the exhibits as well as the schedule for that days shows and activities. 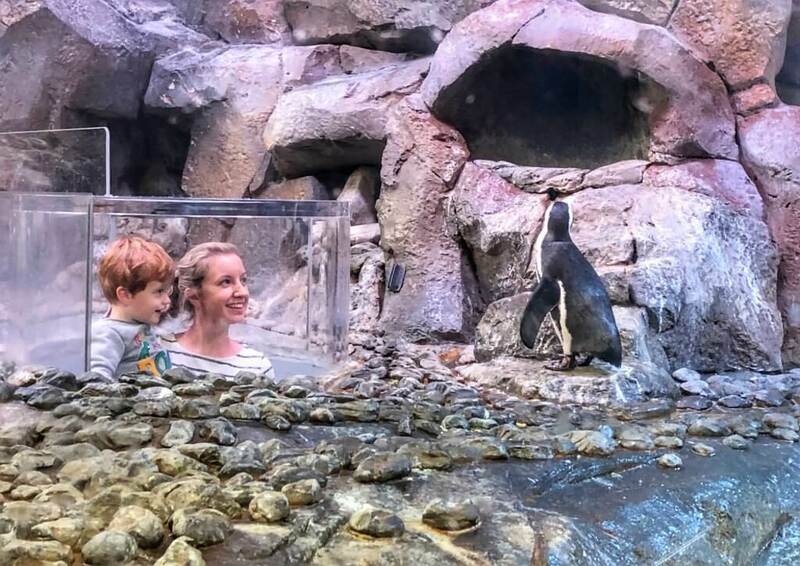 The aquarium has numerous exhibits, shows, experiences, and entertainment to keep the whole family busy, and we loved absolutely everything we experienced. 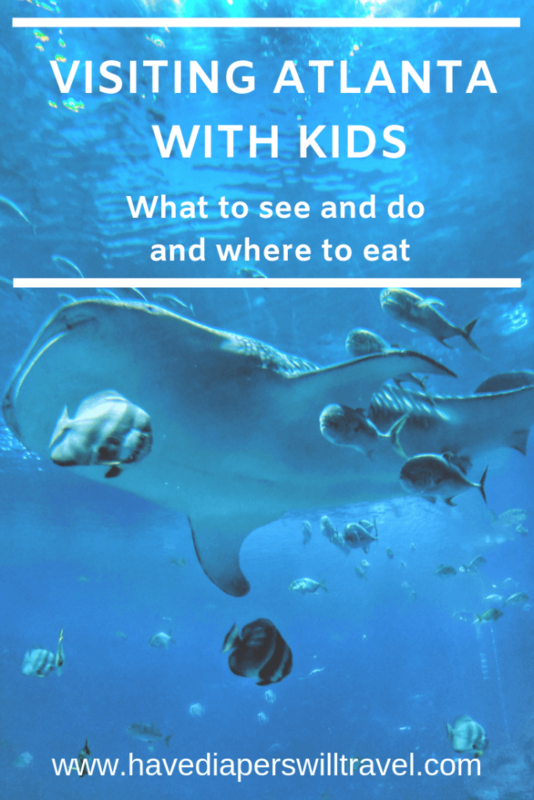 When we entered the aquarium, there were plenty of employees there who asked if it was our first time visiting and when we said it was, they went over everything we needed to know as well as highlighting the most popular exhibits. Our number one goal was to see the whale sharks, and they did not disappoint. The tank that houses the whale sharks is absolutely huge, and we were able to spot plenty of other amazing fish in there hanging out with the whale sharks. 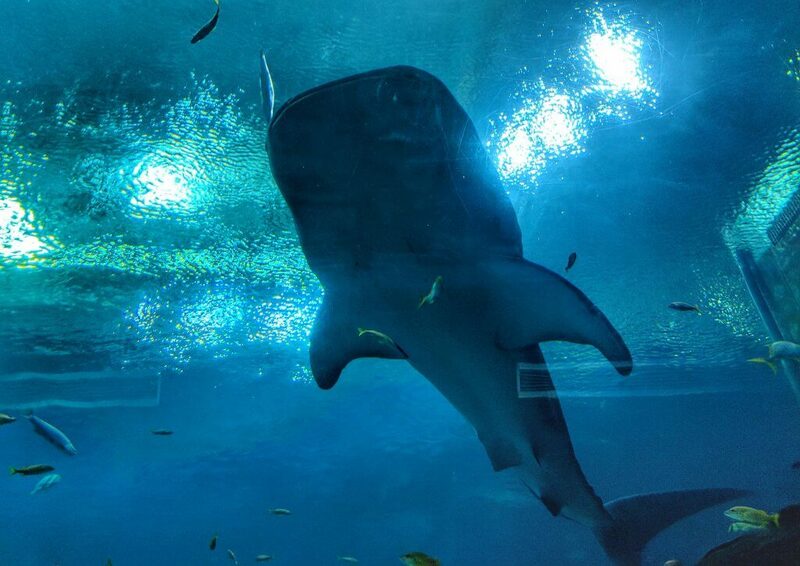 There was a tunnel with a moving walkway that took you right underneath the tank, and my boys love watching the whale sharks swim over the top of them. 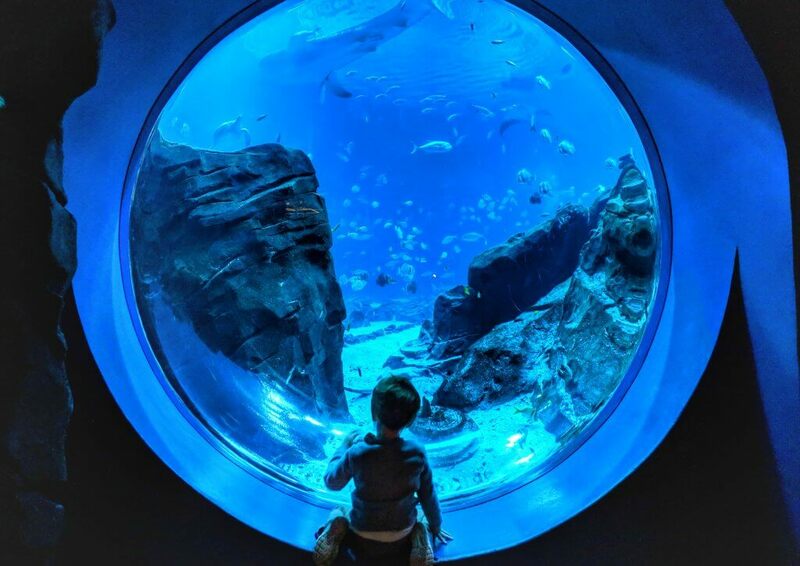 There is also a huge viewing window with an amazing view of all of the fish, and sitting in that spot honestly kept my boys attention better than any TV show or movie – they were spellbound! As well as the whale sharks, we loved hanging out with the beluga whales, interacting with the penguins in a really fun exhibit where you get super close to them, watching amazing sea lions in a fantastic show where we learned all about them, and the kids adored the Touch Tanks, where they got to (gently!) touch star fish, crabs, and other sea creatures. We also ate lunch in the cafe, where we were impressed with the quality of the food and the prices. I also loved that there were refillable water bottle stations throughout the aquarium to reduce plastic waste. We spent six hours at the aquarium before we had to move on to something else, but honestly we could have spent much, much longer there, and I would definitely plan on spending most of your day there. There are a number of additional experiences available here, including the opportunity to swim with the whale sharks, and all of those can be booked online before your trip. 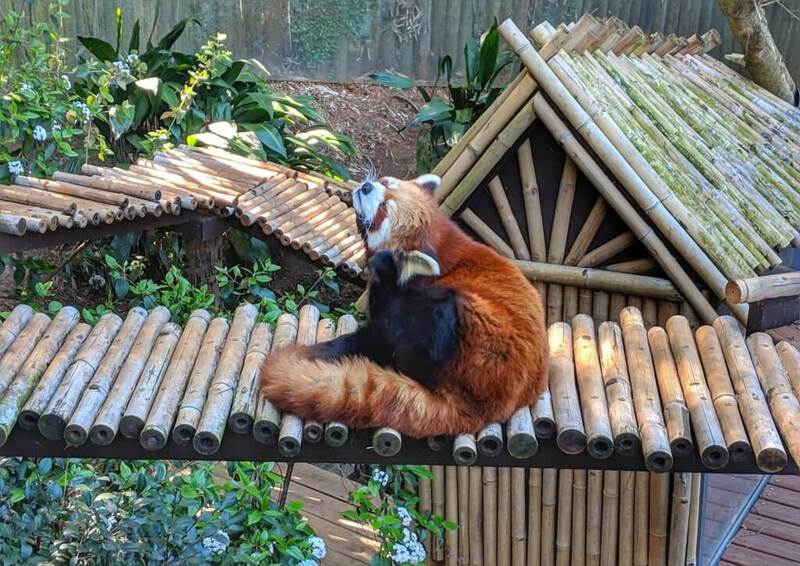 Another one of our favorite activities was the Zoo Atlanta, which is located not far from downtown Atlanta. This isn’t something you could easily walk to if you’re staying in the heart of the city, but it’s a very short drive or Uber ride, and there is plenty of free parking. Tickets can be purchased online in advance. 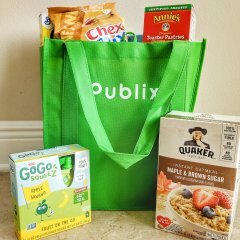 which I would recommend not only for a better price, but to avoid long lines at the entrance. The zoo does have maps available, but you can also download a map ahead of time from the website, and there is somewhere to recycle maps at the end of your visit. The zoo has some really fantastic exhibits, but the one we were looking forward to the most was the Giant Panda Exhibit. 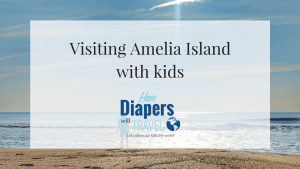 Located towards the back of the zoo, this was our first stop since we were worried about it getting too crowded for our little ones to see (on our trip to San Diego, the lines at the panda exhibit at the San Diego Zoo were very long!) 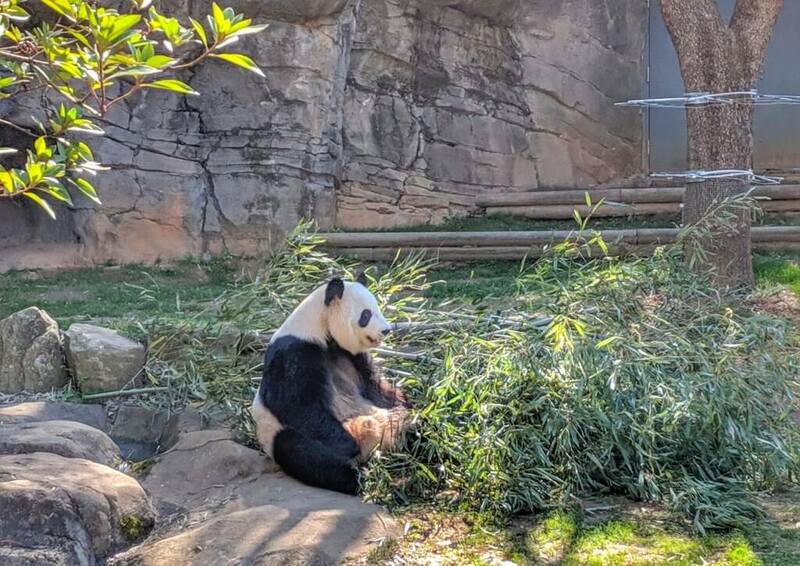 We arrived to find just a small crowd, and plenty of chances to see the gentle animals playing, interacting with each other, eating bamboo, and just generally being adorable. Another favorite exhibit was the Gorilla Exhibit, where the kids got to learn about the critically endangered Western Lowland Gorillas, and the conservation efforts of Zoo Atlanta and 50 other accredited zoos to improve the lives of gorillas through the Gorilla Species Survival Plan. The zoo also partners with the Dian Fossey Gorilla Fund International to help protect the less than 1000 gorillas left in the world and their habitats. Teaching my kids about these conservation efforts, as well as what they could do to help, was a really important and educational part of our trip, and I was so happy this information was readily available to them. As well as all of the animal exhibits, the zoo boasts a great playground for kids to let off some steam, a carousel, a train ride, a splash pad, and more. We spent several hours at the zoo and could have easily spent more, there was so much to see and do. 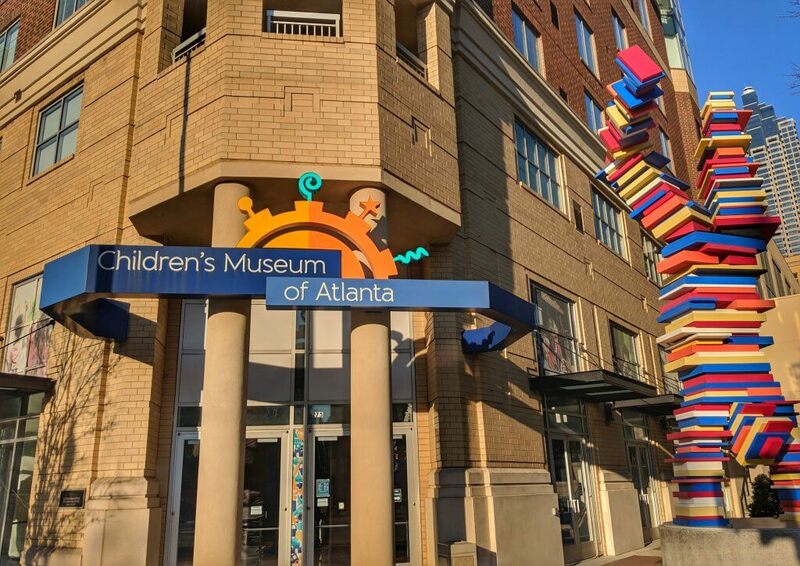 The Children’s Museum of Atlanta is packed full of interactive exhibits to keep kids busy for hours. The museum is located in downtown Atlanta just steps from Centennial Olympic Park and a short walk from the downtown Atlanta hotels. The museum is closed most Wednesdays (exceptions are made during busy times, but check online before planning your visit) and tickets are cheaper when purchased online in advance. 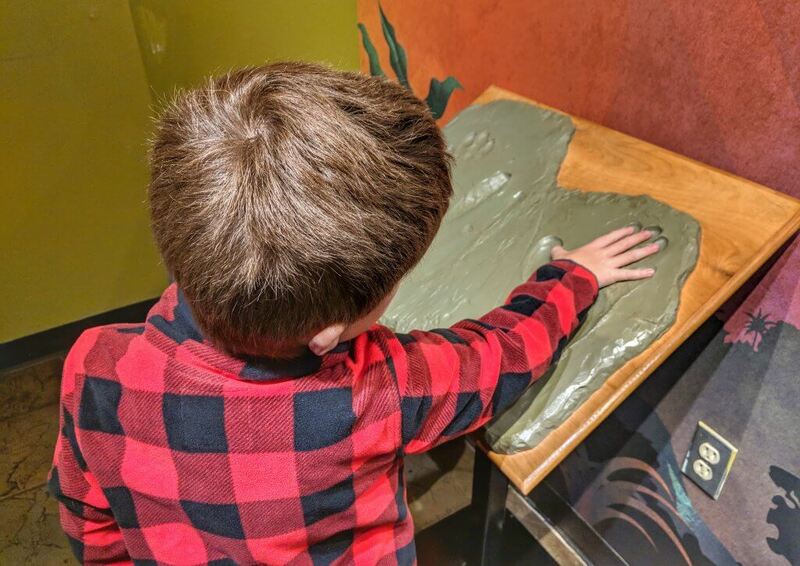 Our favorite exhibits included Let the Creativity Flow, where kids can paint, build sandcastles in huge sandboxes, and even dress up and play pretend on stage. We also loved the super interactive Tools for Solutions, where kids can use a digger to pick up balls, stack blocks to make different types of buildings, and even build a house! There is also an area just for babies and toddlers, where they can enjoy a bubble wall, a fishing pond, and a play house. 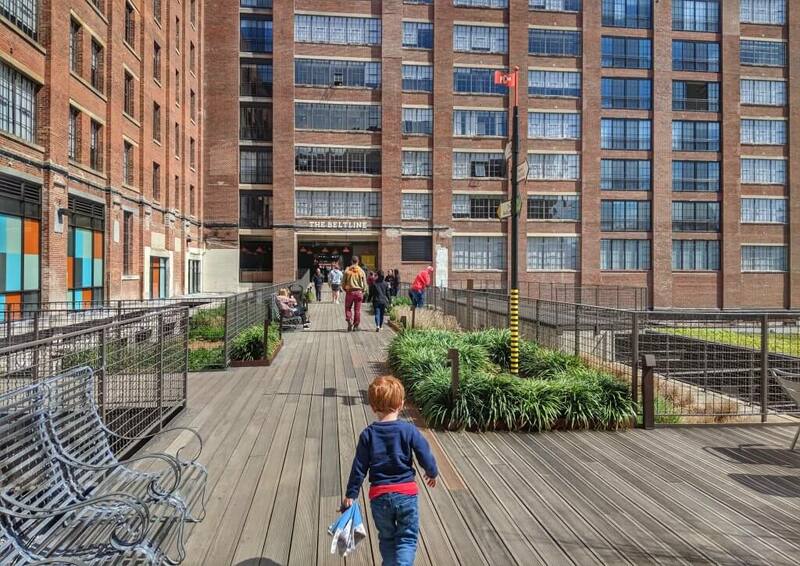 This is a great place to let kids run around and play in an area that’s totally designed for them. Read more on the best museums for kids in the US here. 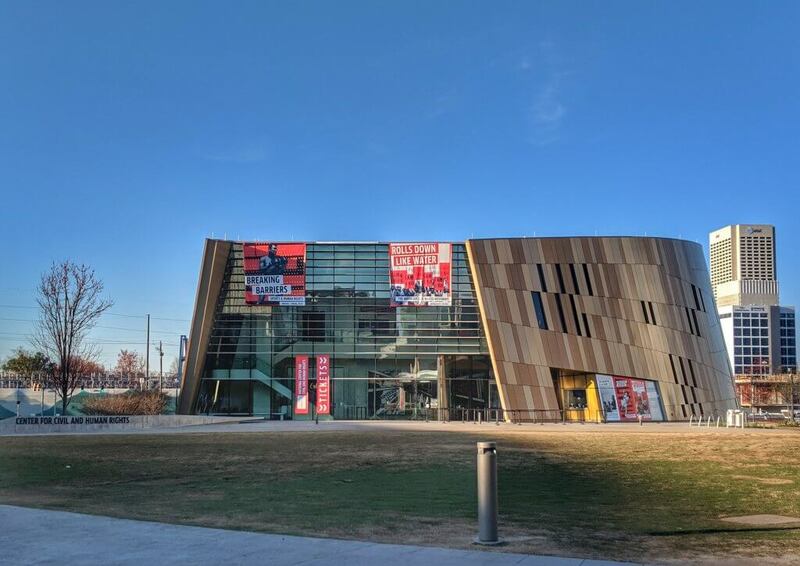 The National Center for Civil and Human Rights is located in the same plaza as the Georgia Aquarium and the World of Coca Cola, just off Centennial Olympic Park. This is a great place to go if you have slightly older kids, particularly kids who are interested in history or are studying civil rights in school; I was suggest grade school and up rather than toddlers or preschoolers. The center features permanent exhibits focusing on the American Civil Rights Movements of the 1950s and 1960s, as well as the Global Human Rights Movements, both of which feature interactive exhibits, movies, and other ways to get involved in the history. There are also temporary exhibits that change seasonally. The museum covers such an important piece of history as well as covering events that are still important today, and this is a great, engaging way for kids to get involved and learn more. In that same downtown plaza as the Georgia Aquarium and the National Center for Civil and Human Rights is the World of Coca Cola. 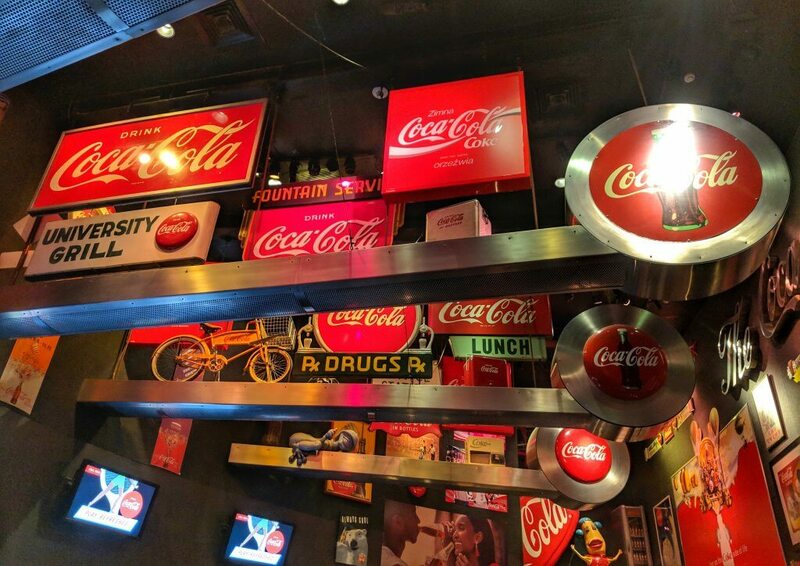 This is a great place to visit for any Coca Cola fan, but even if you don’t really drink the soda, this is still a pretty great place to visit. Not only do you get to learn the history of the company (Coca Cola used to cost 5 cents!) but you can meet the Coca Cola Polar Bear, watch the bottling process, check out all of amazing Coca Cola merchandise and collectibles, and try free soda samples from all over the world (try the melon flavored Fanta from Asia, it’s so refreshing!) There is also a store on the way out where you can buy pretty much anything you’ve ever wanted with the Coca Cola logo! 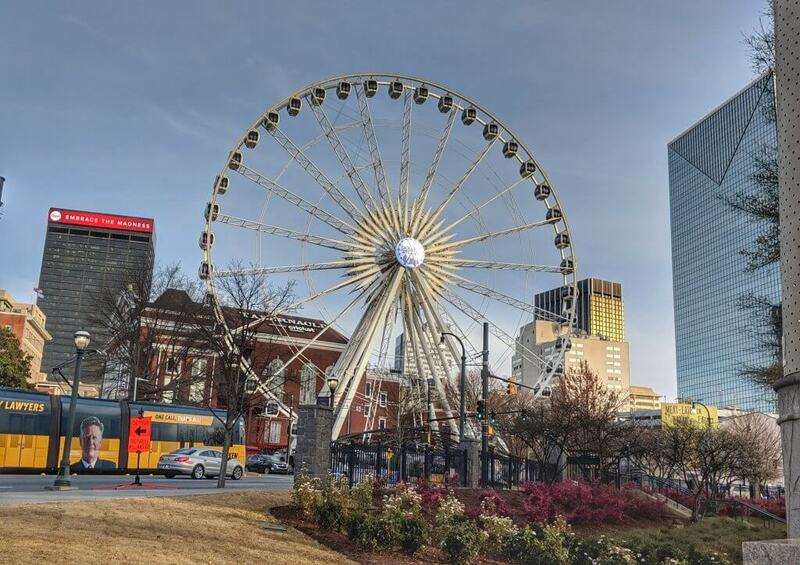 Skyview Atlanta is the giant wheel that you can see from Centennial Olympic Park that offers spectacular views over the city. Cities all over the world have these wheels, and they’re a great way to get an overview of the city and get your bearings at the start of a trip. The wheel turns very slowly, and the pods you ride in are comfortable, with huge glass windows and seating available. If you can arrange it, this is a great thing to do in the evening as the sun sets. 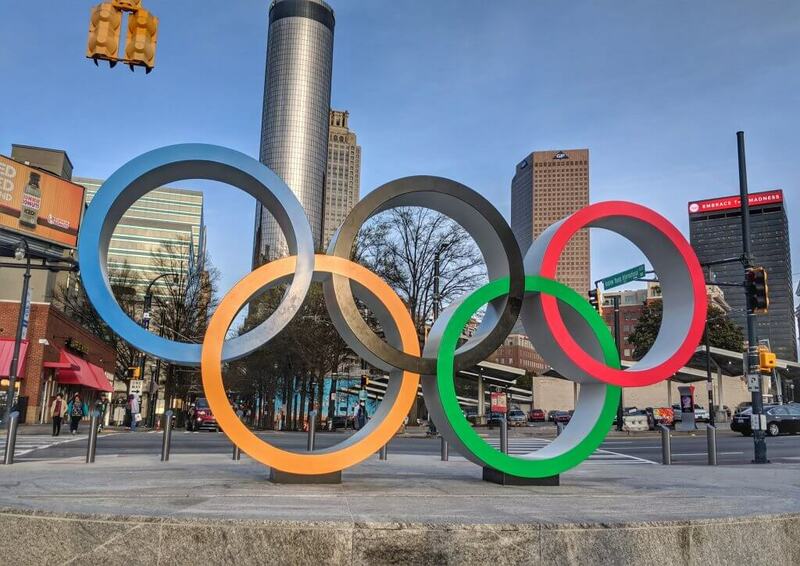 In the heart of downtown Atlanta is Centennial Olympic Park, Atlanta’s lasting legacy from the 1996 Summer Olympics. 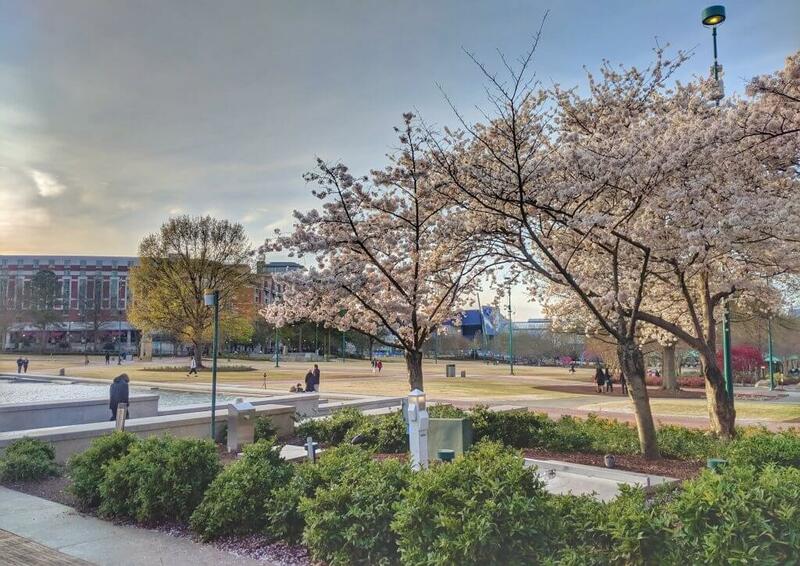 It is a large open space where you can find the giant Olympic rings, water fountains (perfect for cooling off in the summer), playgrounds, and wide open spaces perfect for kids to run around or to have a picnic. While we were in the city in spring, the cherry blossoms were in bloom and the park looked beautiful. The park is close to other downtown attractions, and we walked through it every day. There are several special events throughout the year such as Fourth of July celebrations, holiday festivities, open air movie nights, and more, so take a look at their website to see if anything special will be happening during your visit. Even if nothing is going on, it’s still a fantastic place to go in Atlanta with kids to give them a break from sight seeing and let them have some fun in the fresh air. While their are no shortage of restaurants and other places to eat in Atlanta (and we had planned to eat in several of them) we only ended up eating in two places during our entire trip: Ponce City Market and Krog Street Market. These two places were the absolute perfect places to eat in Atlanta with kids, and I can’t recommend them highly enough if you’re visiting Atlanta with kids, especially if you’re traveling with pick eaters. 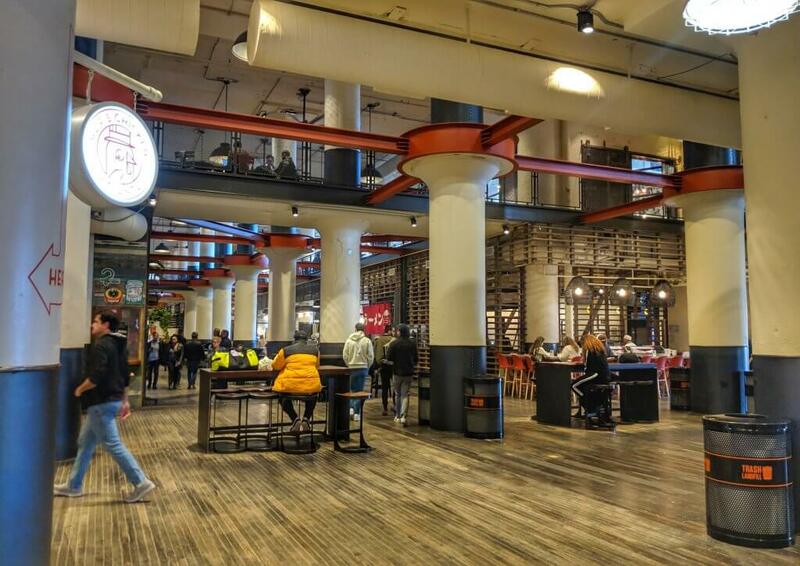 Ponce City Market is a huge open air retail and dining space created around the restored Sears building, with the central hub being the huge food hall with every type of food imaginable. 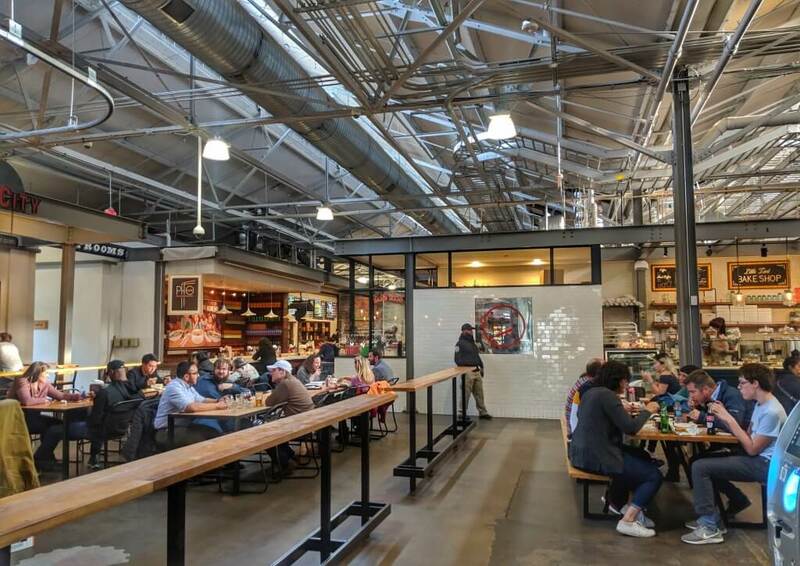 These food halls are absolutely perfect when traveling with kids, as there is sure to be something to suit every taste, and there is plenty of seating available both indoors and out to enjoy your meal. We tried as many of the vendors as possible, but our personal favorites included Hop’s Chicken for the best fried chicken and waffles, Honeysuckle Gelato (try the Brown Butter Crunch, you won’t regret it! ), and Bellina Alimentari to pick up Italian meats and cheeses to take away for a picnic. We liked sitting upstairs so we could people watch all of the people walking around downstairs, and we loved that there were so many places to recycle waste. 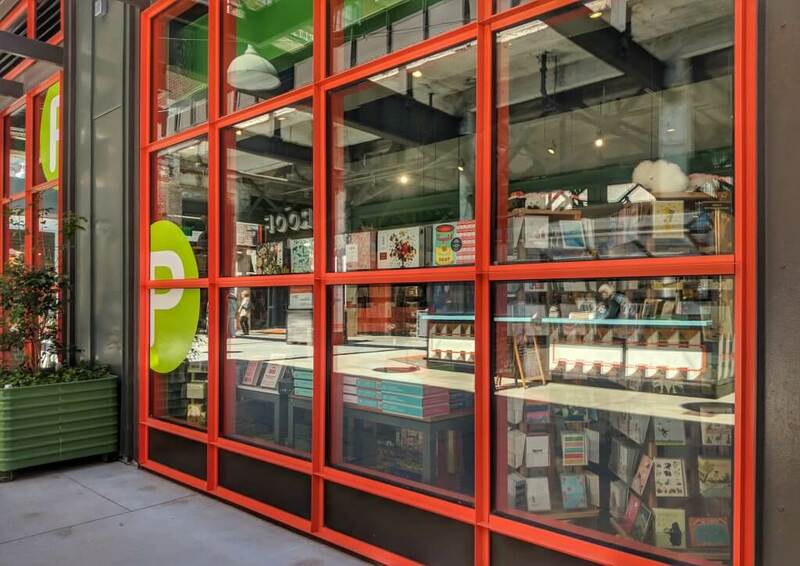 We also found a fantastic bookstore across from the food hall called Posman Books that had a number of books focused on the local area, which we loved. One of the other fantastic features of the Ponce City Market is The Roof. We only made it up to the second story of the market, which houses a walkway that connects out to The Beltline, a multi use trail around the outskirts of the city, but it’s definitely worth heading up to The Roof where you can find an 18-hole mini golf course, boardwalk games, and yet more unique places to eat and drink, all with amazing views out over the city. This is such a fantastic use of space, and something that we never would have known existed had we not stumbled upon it, so definitely make some time to visit. One thing to be aware of when visiting Ponce City Market is their slightly unusual parking system. In order to save parking spaces for those visiting the market, their parking lot is a paid lot where you need to pay before you enter the market. Although there are regular parking machines, we used the app recommended on their website; this sped up the process and was much more convenient, but only after the first time we did it! I would recommend downloading the Park Mobile app in advance and putting in all of your information ahead of time (the license plate number of the car you’re driving, and credit card information) so that you’re not trying to do this stood in the parking lot (and if you’re parked in an underground lot, you’ll find this difficult since there will be no internet connection!) You put in the duration of time you wish to stay in advance, and then we set up the app to notify us when we only had 15 minutes left so we could start wrapping things up. Parking rates were very reasonable, and we actually came to love this system. 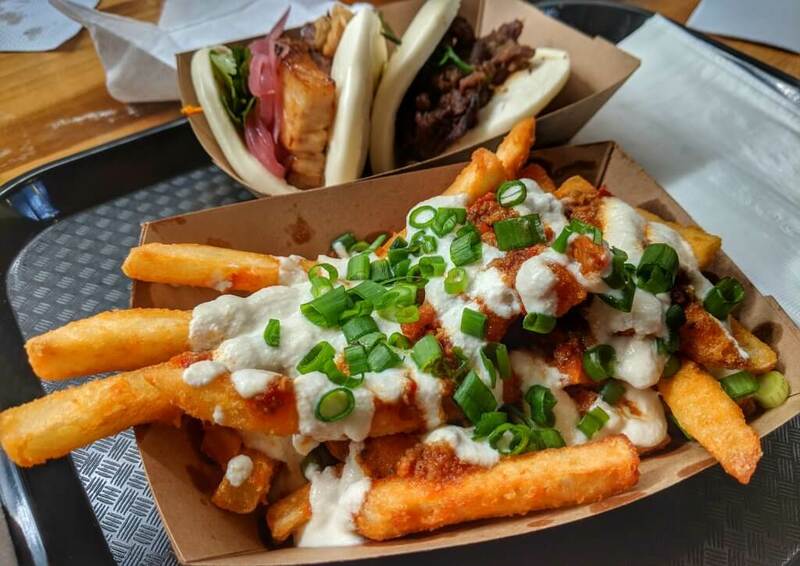 Krog Street Market was a much smaller version of Ponce City Market, with just an indoor food hall and some indoor and outdoor seating, but we found the food options to be just as good, if not better. Some of our favorites included Grand Champion BBQ, which we all agreed had the best mac and cheese in the whole city, Suzy Sui’s Baos, which not only had fantastic bao buns but the sweetest, friendliest employees who went out of their way to interact with our kids, and Jeni’s Splendid Ice Creams, where our favorite was the Milkiest Chocolate ice cream. Parking here was a little limited; we had no problems early on in the week, but the later we came (and the closer to the weekend) we found spaces to be a bit harder to find. This isn’t really in an area you can walk to, so it might be worth considering an Uber from the city center rather than trying to find a parking space. We received complimentary admission to the Georgia Aquarium and Zoo Atlanta on this visit. As always, all opinions are my own. 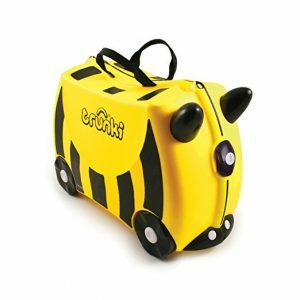 Have you been to Atlanta with kids? What was your favorite thing to do? Let me know in the comments! I’ve never been to the South and I’ve been trying to figure out which state to explore first. 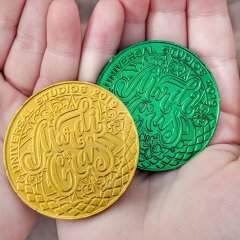 This is making me want to bring my kids to Atlanta for all the kid-friendly fun! Love Atlanta. It is a great city for kids. The Georgia Aquarium and World of Coca Cola are our favorites. Thanks for this list! Atlanta is a place i want to bring the kids. this will be a great reference.